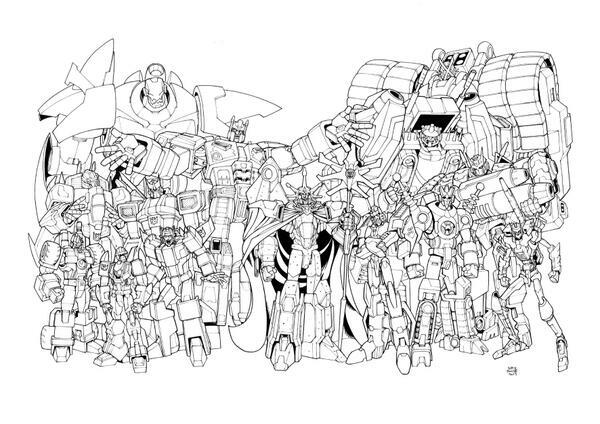 Nick Roche has tweeted some lineart for one of the prints that he will be selling at Auto Assembly 2013 this weekend. This print, titled “More than Meets the Bad Guys“, showcases many of the villains featured in More than Meets the Eye over its first 19 issues – be warned, this print does include the villain from Remain in Light! Do not click on the thumbnail at left or the link above if you do not want the identity of the villain of this arc to be spoiled! In a later tweet, Nick Roche has also teased a second print, “More than Meets the Feels”. Lastly, Nick is polling interest in having more copies of last year’s Lost Light crew print available at Auto Assembly 2013, which showcases the core cast of the first arc of More than Meets the Eye. If you want a copy, tweet Nick here to show your support! Auto Assembly 2013 is taking place this weekend, 9 August – 11 August 2013 at the Hilton Metropole in Birmingham, England. As well as Nick Roche, guests include Neil Kaplan the voice of Robots in Disguise Optimus Prime, Dan Gilvezan the voice of Generation 1 Bumblebee, and Steve Blum the voice of Transformers Prime Starscream and Rescue Bots Heatwave, plus legendary Transformers comics writer Simon Furman, More than Meets the Eye writer James Roberts, and Andrew Wildman, Liam Shalloo, Ed Pirrie, Kat Nicholson, Jason Cardy, Kris Carter, John-Paul Bove and making their Auto Assembly debut, Andrew Griffith and Alex Milne! Find out more at the Auto Assembly homepage! Isn't he the one with his arms folded next to the DJD? Crap you're right, who's the guy next to Flywheels? Never mind. I didn't realize "that guy" was so tall. Do watch the spoilers please guys, I know a few people who're not completely caught up yet. The image itself is a spoiler for those guys. And nobody else has mentioned his absence. I'm not sure I would classify it as a mercy killing necessarily… I don't think that was Krok's motivation. It's almost more like if you were in a gang of cannibals, and halfway through your meal, you noticed he was still alive, and casually executed him. Either way, I think that scene did what it was intended to do… remind us that the Scavengers are still scum, even if they seem sympathetic. I think I was trying to get it is relative evil compare to Overlord or the D.J.D. but yeah. It will be different if we see them outside of survival mode. I could say we should let the Autobot burn to death in most painful gruesome manner being burn to death is not a pleasant way to go. I would like to see them earn the title of scum. Zee pack of Hyenas they are. ´s second in Command, is not among the list. Now if only we'd see more of these guys in the comics…. The Scavengers need a spinoff. Hell yes they do. Written by Nick Roche, at that. I think Roche might even inch out Roberts for me. Krok is tiny. They could reuse the bomber megs figure for him. Ha! That could actually work, considering that G1 Krok's "kibble" seemed to indicate that he was some kind of stealth jet. I am remember the campfire to certain extent the Autobot was going to die regardless if Krok did not shoot him or not. It is a mercy killing but setting it on fire well that is another story. In truth I am not surprise Fulcrum is on the list. James did write Fulcrum in Eugenesis as being a traitorous and I will not be surprise that is the case. Scavengers do need their own series as evil bad guys they are bottom of the barrel somehow I don't see them being rivals of Lost Light crew for long. Erstwhile allies Lost Light crew will join up and fight bigger baddie in the future. Lesser of two evils that what the Scavengers are. That's werid. It's not like Roche COULDN't sqeeze them in since his Lost Light crew print had MUCH more characters. Maybe it's a hint who's not going to survive/who's not evil at all? Yeah, I have that idea as well. Looking forward to picking one of these up, a nice companion to the Lost Light print from last year. Anybody heading down to AA could help me pick up a couple of these please?? Personally, I think a big part of the appeal of the Scavengers is the reminder that they still ARE bad guy, despite being so lovable. Things like the campfire incident serve to reinforce the idea that they are still despicable, even while being funny and a bit pathetic. I am, however, miffed to say the least that everyone's favorite scavengers are included in this "badguy roundup". They are TERRIBLE at being bad! They're so bad at being bad that they might as well be good guys (granted, Krok did put out their campfire in more ways than one, but his chest was hollowed out and already on fire). I just hope they make a glorious return at some point. We got like 2 issues with them, then a subsequent twelve without. If they were a one-shot, I call shenanigans. woah, they let you out of the dungeon to post? but really, i can't wait to see this fully covered. working on getting a copy of it now, along with last years. is in the image and he's dead. Ya, I forgot about that.